The newly elected governor, who campaigned against the death penalty, said the moratorium will remain in effect until he has reviewed a task force report on capital punishment. The task force review has been ongoing over the past four years, examining a number of questions surrounding the death penalty – including how it is carried, out, whether it’s constitutional and if it reduces crime. In 2012, the task force called on former Republican Gov. Tom Corbett to suspend executions. Wolf said he is not sympathetic for the guilty inmates of death row, but noted that the state has only executed three people since it reintroduced capital punishment almost 40 years ago. Even those three cases only went forward because the inmates requested an end to their appeals process. Previous governors, meanwhile, have signed 434 death warrants, and all but the previously mentioned three were stayed by a court. One inmate has been scheduled six times for execution before the process was cancelled by federal and state interventions. Two inmates have been on death row for three decades. The governor’s decision also puts off the execution of Terrance Williams, who was convicted of killing two men, which was scheduled for March 4, 2015. Williams admitted killing them while in his teens but now says both men had been sexually abusing him. "If we are to continue to administer the death penalty, we must take further steps to ensure that defendants have appropriate counsel at every stage of their prosecution, that the sentence is applied fairly and proportionally, and that we eliminate the risk of executing an innocent," Wolf said. The governor's office also released two statements supporting his decision, including one from former US Court of Appeals judge and prosecutor Timothy K. Lewis. "At a minimum, we must take a step back to examine the effectiveness of a system fraught with racial disparity, constant reversals, and the infinite warehousing of prisoners who await a punishment that hasn't been imposed in our State in 15 years," said Lewis. The Pennsylvania District Attorneys Association said the Governor had no authority to impose a moratorium. "He has rejected the decisions of juries that wrestled with the facts and the law before unanimously imposing the death penalty, disregarded a long line of decisions made by Pennsylvania and federal judges, ignored the will of the Legislature, and ultimately turned his back on the silenced victims of cold-blooded killers," the association told the Associated Press. It said legal action in response was likely. 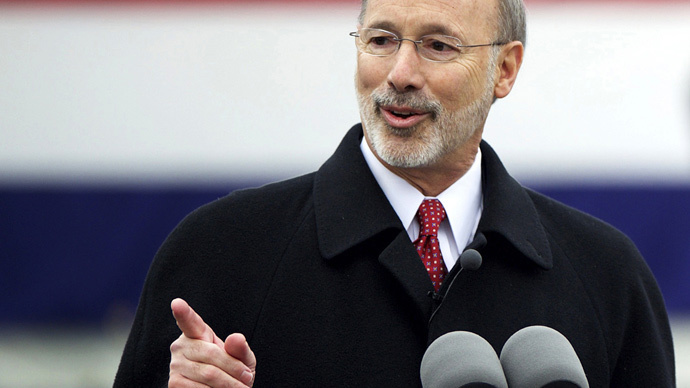 Wolf said that if the state is going to “take the irrevocable step of executing a human being, its capital sentencing system must be infallible.” He said the system was riddled with flaws and studies had called into question the accuracy and fundamental fairness of Pennsylvania’s capital sentencing system. The studies suggested there were inherent biases indicating that a person is more likely to be charged with a capital offense and sentenced to death row if he is poor or a minority racial group, and especially so if the victim of the crime was white.